It’s been a few years since Neil and I have lived in St Petersburg, FL but we are in town temporarily to fix up our house. While we are here, we’ve been trying to figure out a good place to buy wine besides the grocery store. 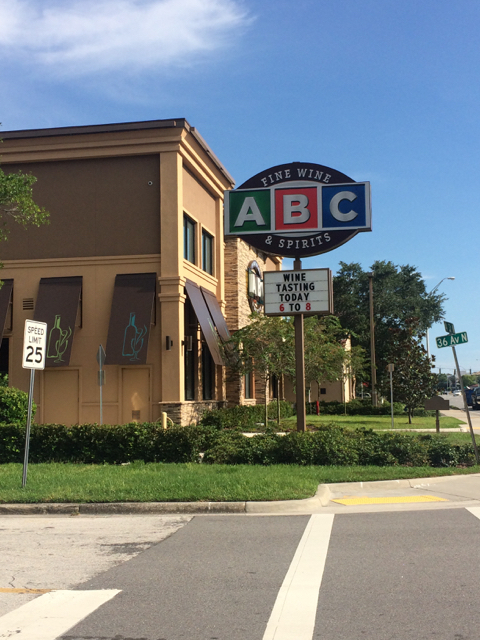 An ABC Fine Wines and Spirits, http://www.abcfws.com, was built down the road after we left and last week we just happened to find out that they were holding their semi-annual wine tasting. 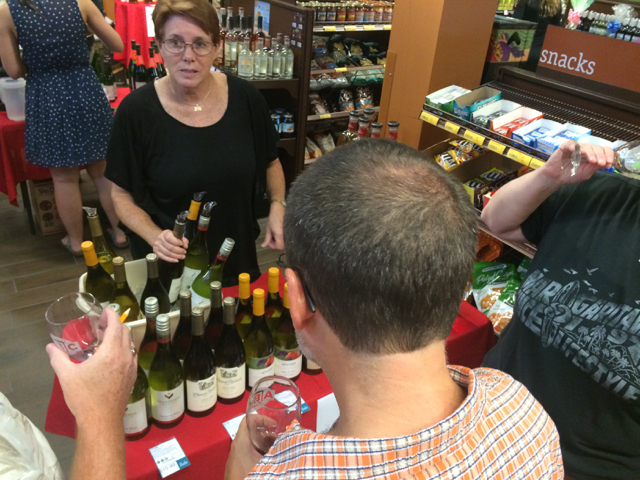 When we called the store about making a reservation, we found out there would be over 50 samples of wine and spirits. Obviously we planned to check it out! We arrived a few minutes early and found a line of people ready and waiting for the tasting. It was only $10 per person and you got to keep the wine glass. 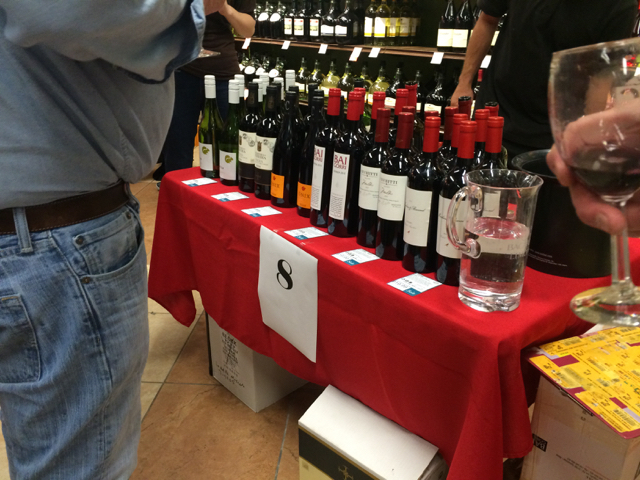 The store was divided with wine samples on one side and hard alcohol on the other side. Neil and I consulted our tasting list to plan our route. 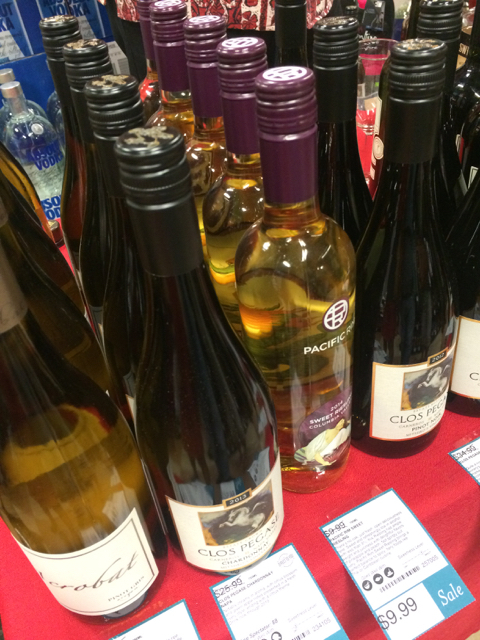 There were a bunch of brands that we have seen when scouring the wine aisles in the local grocery stores but also some that were new to us. As you would expect, we started with the white wines. In order to avoid the crowd, we moved to a table near the back of the store with New Zealand wines. The person pouring the wines let us know that the Jules Taylor brand is made by the previous winemaker for the famous New Zealand brand, Kim Crawford. Jules Taylor makes a Sauvignon Blanc and her husband followed suit and created the “Better Half” sauvignon blanc. Neil and I began with these two wines. Neil started with the Sauvignon Blanc from Jules Taylor and found it to have tropical, orange, and pineapple aromas with a tropical, fruity, clean flavor. I had similar notes for the Better Half Sauvignon Blanc but when Neil tried it, he was unable to find all the flavors and just said it wasn’t as good as the first one. We both tried the Gruner Veltliner at that table and Neil gave it much better reviews than me. He identified creme brûlée and caramel, and found it to be light and fun. I thought it smelled like cat pee and tasted wood and honey. Time for the next table. I’ve been exploring wines from Washington, in my Tuesday night WineChat, #WiningHourChat, so I made my way over to a table featuring Washington wines. I’ve seen the 14 Hands brand in the grocery store but never bought it, tonight was my chance to sample it. We both tried the white blend, it smelled ok to me with citrus and pear aromas but then it was sharp and smooth. I didn’t like it. Neil noticed musk and alcohol aromas with sweet honeydew, and vanilla flavors. I figured I’d try the Chardonnay too, which had oak and apple aromas but then a caramel flavor. It would have been too sweet to have with food. Neil tried the Pinot Gris at the table, but it was a little weird with aromas of pepper and a sweet, heavy flavor. After this table, we decided to split up and try some different wines. I made my way over to a table with Italian wines, and continued with some white wines I had never had before. The first one I tried, Nadia Malvasia, smelled like pineapple, coated my tongue and maybe tasted like peach. It was kind of a sweet wine and I wasn’t really ready for it. The next one, Marotti Campi Verdicchio, was pretty crisp and I couldn’t pick out any specific flavors but I thought it might have been good with food. Neil decided he wanted a little Prosecco before moving onto some red wines. It smelled like lemon candy but seemed too heavy for a prosecco. He thought it might have been too warm. After reading through our notes, I found it funny that we both had a theme for our red wines. Although I’ve never really enjoyed Malbec wines, I figured that night would be a good chance to try some more. 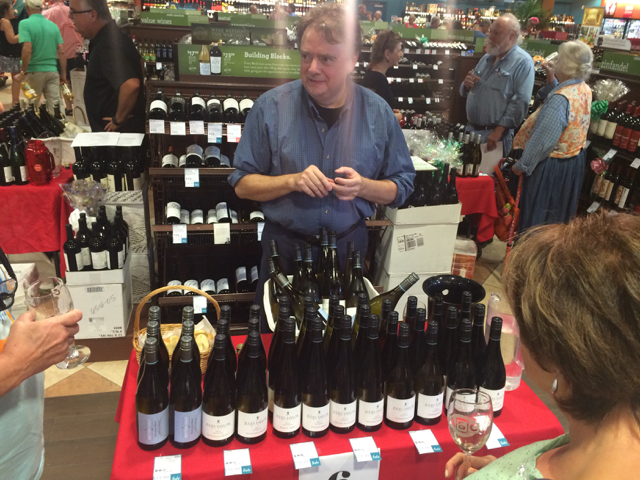 Neil knows that he likes Pinot Noir, so he went on a search for some new favorites. I began my Malbec tasting with a rosé by Gouleyant out of the wine tap. It smelled like berries and tasted crisp but was very dry with almost no flavor. When I’ve had malbec’s in the past, I usually notice a dryness with hardly any flavor so I guess I was on track. 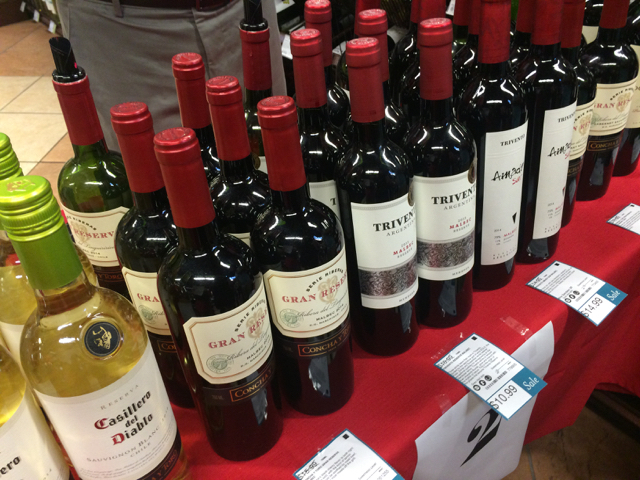 There were a few tables that had South American wines so I made my way over to the first one. Someone once suggested that Argentinian Malbecs are quite different from Chilean Malbecs, lets see which one I like better? I tried M&B from Argentina to begin. 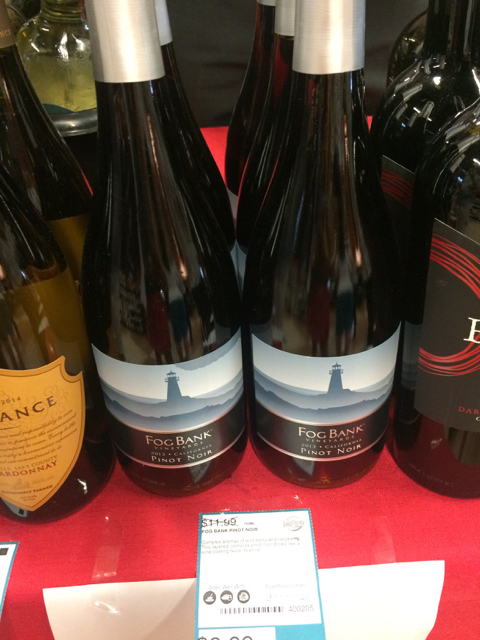 I noticed aromas of rocks with a hint of fruit and flavors of cherry, blueberry and more rocks. Instead of being really dry, like the ones I’ve had, this one was almost so fruity that it seemed like cough syrup. Oh well, next up, Trivento Reserve Malbec, also from Argentina. This one also had aromas of rocks but smelled like candied fruit too. The flavor was kind of sharp but then it smoothed out until it became dry. The third Malbec, Gran Reserva, was from Chile. It smelled tart, sour and reminded me of cat pee while it tasted dry and like alcohol. 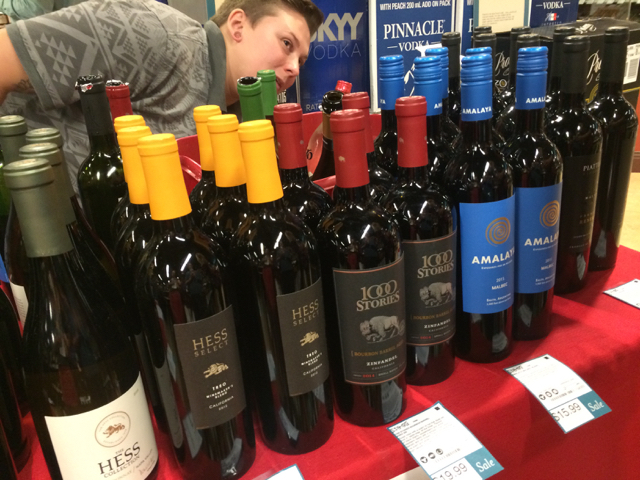 I finished out my Malbec tasting with the Amalaya Malbec Blend from Argentina. The flavors I identified were smooth, rocks and a dry finish. It had a funky aroma that made me not like this one either. So now that I’ve tried another 5 malbec wines, I can say that I still don’t like it. But to be fair to the varietal, it’s not personal, I just don’t like rocks in my wine. Now onto Neil’s Pinot Noir tasting. He began with one that we tried around New Years Eve. We remembered the Clos Pegase label and he found it to be equal fruit and spice flavors. It smelled like black cherry and had a great finish with a kick. His next one, Fog bank, is another one he had tried before. This one had berry and pepper aromas with a little spice but it kind of fell flat. The Erath Pinot Noir had aromas of dark berry and a slight spice. The flavor was big berry, worcestershire/bbq sauce with a hint of alcohol. Neil really liked this one! His final pinot noir was from Rodney Strong in the Russian River area of California. This wine had light fruit aromas, a light berry flavor, lots of spice and some alcohol. After these, he moved on to the Italian wine table to try out some other red wines. The first wine, La Calocina Cortona smelled like big, dark fruit and slight spice. The flavor was dry, fruity and big. The next wine, Nicolas Seccal, had oak and licorice aromas with flavors of pepper, spice and something that reminded Neil of granite or slate. He tried one more, Tontine Ettore, that smelled and tasted like leather. This was the first wine where he identified leather so he was pretty excited. Neil still had a few wines on his list that he wanted to try. There was only one sangiovese on the entire list but Neil just described it as dry. He was excited to find a Zinfandel on the list too. The Beran Zinfandel had dark berry and spice aromas with delicious fruit flavors and was a little sweet and dry. He tried one more, Carne Humana, which translated into Human Flesh. This blend had petite sirah, petit verdot, and zinfandel, all grapes that Neil enjoys. Since he likes these grapes so much, he was really trying to identify the flavors and aromas but his palate was pretty saturated by that point. He did notice that it was good, heavy and had big fruit. After all my malbecs, I decided to move onto a couple sweet wines. The Pacific Rim Riesling was from Washington too. The aromas were honey and tart with flavors that were sweet, smooth, creamy and tropical. I’d describe it as medium sweet, it wasn’t too extreme. My final wine of the evening was the infamous Blue Nun. 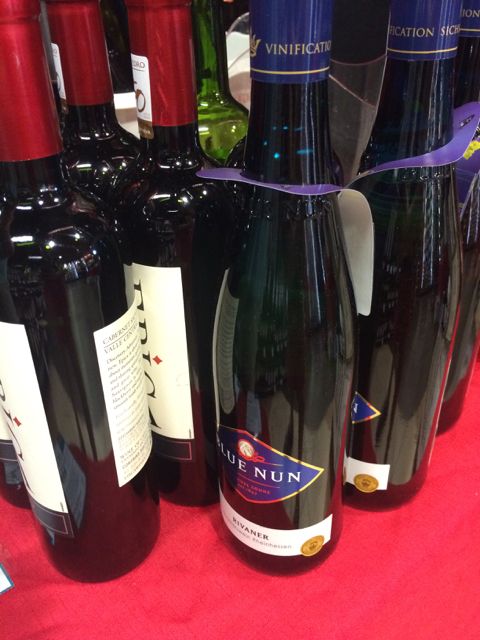 Anyone in the wine world has heard of the reputation of getting drunk on Blue Nun as a teenager. I had to try it to see the draw. It smelled kind of funky and sweet but tasted bland with a slight fizz and maybe some pineapple. Really nothing good, guess people are after the $5.49 price tag? At least I got to try the wine I’ve heard so many stories about. We both tried a few of the hard liquor samples too. Neil sampled a bourbon, sake, rum and margarita. I went over to the table for St Petersburg Distillery (http://www.stpetersburgdistillery.com) and had their gin and coconut rum. 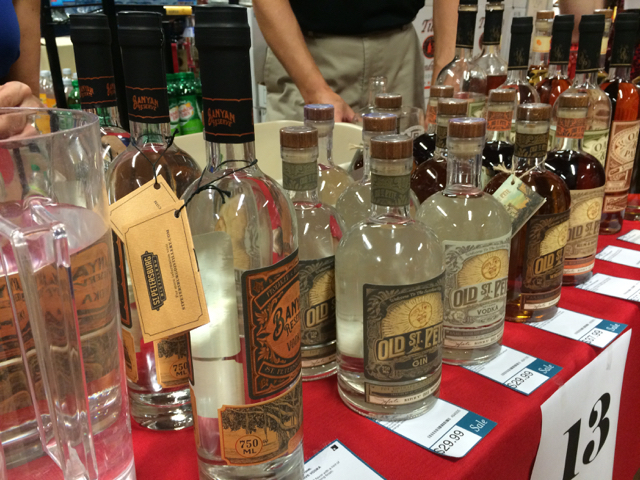 Although I’m not usually much for liquor, it was fun to try a local gin. It was pretty incredible to have so many different types wines to try. Neither one of us really found anything we wanted to take home but it was helpful that we’ve had more exposure to some of the wines we’ve seen around. And now we have a better idea of possible recommendations to friends.